STATE CAPITOL, PHOENIX – Rep. Lela Alston, D-Phoenix (District 24), voted no on a last-minute amendment to SB 1339 in the House Appropriations Committee on Wednesday, saying that the bill will punish people for civic engagement. A bill with the same language faced bipartisan opposition and failed last week. 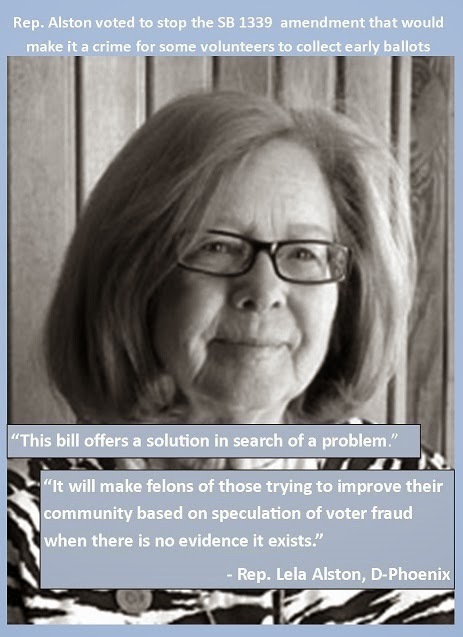 Opponents argue that this bill offers a solution in search of a problem and that there is no evidence that the voter fraud the legislation claims to prevent even exists. Alston added that the legislation is also unnecessary because current law makes tampering with a ballot illegal. Republicans passed SB 1339. “This bill goes way too far, making felons of those trying to improve their community based on speculation of voter fraud when there is no evidence it exists,” said Alston.